L-R: Marie Susplugas, Steve Sculpher, Rupert Chandler, Dany and Dave West. are a distinctive, versatile and musically broadminded group of exceptionally talented musicians from the Thames Valley (UK). Their songs combine a catalogue of contemporary styles into wonderfully listenable numbers delivered with great passion, feeling, warmth and intelligence. Styles range from driving blues-rock, through plugged-in laments like the brilliant Maria Bahran, acoustic songs with jazz and country elements, mellower soul/funk grooves tastefully blended with ambient folk-rock, to dramatic, in-yer-face stream-of-consciousness songs like These Images at one extreme and heart-warming gospel-style anthems such as Monument to Love at the other. Tuneful, memorable melody lines and colourful, seductive instrumentation are combined with songwriter Dany's graphic lyrics, sensitive yet commanding vocals and catchy refrains into fresh, evocative songs that come over well on casual listening yet incorporate plenty to invite deeper listening. songs are often mistaken for lost rock classics! 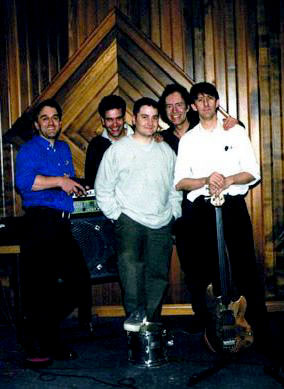 L-R: Martin Gray, Vince Cooper, Mark Cooper, Dany and Steve Sculpher. Inspired by mainman Dany, have now produced six CDs of original songs covering acoustic numbers, vibrant rock songs and mellow, jazzier compositions, and a new solo CD Waiting Room from Dany is now available. The variations to 's lineup over the years have prevented the band getting stuck in a rut with a single, predictable 'sound'. The first lineup combined Vince Cooper's great guitar playing with extrordinarily liquid sax and flute from Martin Gray, a master of space and timing. With Steve Sculpher of the flying fingers ever present on bass, and Mark Cooper on the drums, they produced rock classics such as Fine Line and Growing Wild, from Out Of Our Heads Again, while its sister album Some Wide Horizon captured 'unplugged', with folkier songs like the beautiful Down at the Waterhole and The Road to Paradise. Ex Mungo Jerry keyboardist Steve Jones was a regular contributor to recordings from the very outset. He became a full member after Vince moved on, leading to the much jazzier sound evident on the Funny How Time Flies and Faraway Friend albums, with great songs including 6 Billion Of Us and Vapour Trails. Then, superb drummer Rupert Chandler joined the band, heralding a transformation to a more fusion era with Yeah, but... including classics like Blank Paper Syndrome, These Images - inspired by the 9/11 atrocity and featuring an amazing 5 tracks of layered guitar from Nick John - and the almost gospel-style Monument to Love. In 2003, Martin left, giving way to spirited sax playing by Denise Baldwin, who also plays on several of the earlier recordings. Around the same time, 's current ace guitarist Dave West joined, forming the heart of today's lineup. Three years later, Dany moved to France, where he later met French guitarist Alain Cahuzac, with whom he played duets there. Alain also played one full-blown gig in France when Dave was not available, and came over for one Windsor gig. Denise went to South America to do charity work for a time, but has now re-joined. Dany returned to the Thames Valley in 2014 and are now playing here regularly again. Ginni Hogarth has now become a regular member, adding colour to the Irony sound with her keyboard and vocals. Dany has also recently been playing acoustic duo gigs with Dave. are masters at varying their lineup to suit the gig circumstances, whether electric or acoustic. Anything from just Dany on acoustic guitar and harmonica with Dave and/or Steve Sculpher on bass - 4-string, fretless or double. Or the full-on 6-piece for a great rock sound, delivered with passion, power and commitment. Yeah, but... is now available for download from CDBaby. More tracks you can download have now been added to our MySpace profile. At the Reading Jazz Caf� on 20/7/2002. Great news - Dany is moving back permanently to live in the Thames Valley area again! Denise has now rejoined the band after returning from her adventures in Central America. Vince Cooper temporarily re-joined on guitar while Dave West was struck by illness (thankfully, Dave is now recovered and back). Dany has now produced another great solo CD Imagine This, with twelve cracking new songs. Irony now have a new official website to keep us all informed of their latest news, gigs and releases. After keeping up Irony's web presence single-handedly for a number of years, I had latterly become only too well aware that my low-tech style could not meet contemporary expectations such as online shopping facilities, while other commitments increasingly prevented me giving this site the time and attention it deserved. It was time for a change. So I was glad to pass on the baton of running the main Irony website. The new site is well presented and has some good content about the band. It also includes some fascinating photos of Dany from the 70s and 80s. I will be keeping this site going, but from now on as a fan site rather than the official one. I will continue to add photos and other content as and when availability and time permits, but will probably focus less on news and forthcoming gig dates than previously. Feel free to mail us with any comments or questions. Yeah, but... download details added. Site reclassified as unofficial fan site. Biographies page for present and past members added. Colour scheme and stylistic details of main page improved.